A common criticism of the upcoming ST3 ballot measure is that light rail is too expensive and we’d be better off with bus rapid transit (BRT), especially in the suburbs. This article looks at the economics behind such statements to see if ST3 is worth it or not. First, we start with the rush-hour congestion map on the left (from October 4th at 8am). We can see that congested stretches of I-5 exist all the way from Everett to Tacoma and the same is true for local Seattle roads from Ballard and West Seattle. What this means is that more people are trying to travel on the freeway than its available capacity. So how do we accommodate the extra people? Before we do so it’s important to understand the concept of induced demand. This is really latent demand that only materializes once extra freeway capacity comes online. When congestion improves, people who were previously dissuaded from making certain trips now start making them. Moreover, as commutes shorten, new real estate development in areas previously deemed too far becomes possible, which in turn also creates new demand. So the new “empty” road space is quickly filled and consumed with traffic. Now to be as fair as possible, travel demand is not infinite and it is possible to satisfy it with more lanes. The metric we are looking for is lane-miles per capita. Based on this, Kansas City, MO is #1 in the United States with 1.241 lane-miles per 1,000 people (1999 data) and experiences some of the lowest traffic delays for a major metropolitan area. Peak-time trips experience about a 20% increase in travel time (e.g., a 30-minute trip taking 36 minutes). Seattle, however, only has half the number of lane-miles per capita at 0.652 per 1,000 people. If we want to have only a 20% delay in peak-hour trips we’d have to literally double all of our freeways and major arterials. Can you imagine a 22-lane I-405, a 20-lane I-5, and a 16-lane I-90 bridge? Even if you didn’t care about the impact on surrounding neighborhoods, building this across the region would cost hundreds of billions just for property acquisition. The cost would be at least one order of magnitude higher than what Sound Transit is proposing. Buses allow us to move more people in a stretch of road than a car. A 60-foot bus packed with 120 people at rush hour takes up nine times less road space per person to carry than an 18-foot car packed with four people (and average car occupancy in our region is actually 1.6 people per car). But if the bus can get stuck in traffic, the only incentive a person has to switch from their car to the bus is cost. And for most, that is not a strong enough incentive. To increase the percentage of people taking transit, it needs to offer something that auto travel does not–the reliability of not getting stuck in traffic. In other words, it needs dedicated right-of-way. Now, we do have a network of HOV lanes, but it is not consistent and not managed to avoid congestion completely. So even with the HOV network buses still get stuck in traffic between HOV lanes and often in the HOV lanes too. Future demand due to new real estate development. This is hard. Events and crashes often make congestion expand to take a larger portion of the freeway than usual commute traffic. Additionally, new real estate development brings more people to our region and the area of regular commute congestion slowly expands as well. Stretches the entire length of a trip. On freeways this means the entire length of the freeway with dedicated access ramps. Is either HOV 3+, fully transit-only, or dynamically managed which is needed in our region to ensure they always flow freely regardless of demand fluctuations. How do we get this? We can’t simply reallocate a general purpose lane for this. This is a political non-starter. While it is relatively cheap to implement, no car commuter wants to lengthen their commute so that “somebody else” can have a better transit or carpool trip. People have never supported this en masse. The only option we have is to build the new right-of-way—either widen the freeway or build the lanes in a separate structure using viaducts and tunnels as appropriate. So given all this, isn’t it a misguided waste of money for Sound Transit to spend so much money on light rail then? Well, shocker: they are not actually spending most of the money on light rail! Breakdown: 87% spent on new right-of-way plus 13% spent on light rail. * Actual trackwork is specifically part of the U830 contract which is under Systems, not under “Guideway and Track Elements”. So light rail components are not counted erroneously. Breakdown: 80% spent on new right-of-way plus 20% spent on light rail. Note: Financing cost not included in breakdowns above as it is proportionally distributed for all spending categories. So it turns out, most of the money is not spent on light rail, but on building the right-of-way which would be needed regardless of the type of vehicle used! You could even say that Sound Transit’s main job is not to build light rail, but to build right-of-way. Also, bus rapid transit would cost at least 80% as much as light rail! Without the cost of dedicated right-of-way it would not be bus rapid transit and it would not attract new ridership. And if you want to use electric trolleybuses instead of diesel buses, even that 20% savings over light rail starts to erode because the electrical systems are the most expensive part. Rail itself is actually so cheap as to be negligible in cost if installed while the guideway is being built. Now if the cost is the same, you may wonder, why choose light rail over buses? Because it truly maximizes the benefit you get out of your new right-of-way—the theoretical maximum for our light rail system is 32,000 people per hour per direction (today, it’s 16,000 on the existing line before ventilation and emergency escape upgrades are made) while with buses we can only move 6,000 to 9,000 people per hour without bus bunching. And if this math changes in the future, nothing prevents us from repurposing the right-of-way—if it can carry 400,000 lbs trains (four cars), it can certainly carry buses (40,000 lbs per bus) as well. When opponents of ST3 say that bus rapid transit is cheaper than light rail, they are not speaking of true BRT, but simply of more buses. If we want to provide a service that is actually better in the most important way—the ability to avoid congestion travel delays, we need to let Sound Transit do their main job—build new right-of-way—and there are no shortcuts to be taken there. Update 10/12/16: Now using latest incurred cost from Sound Transit’s 2016 Q2 Progress Report. This strengthens the point of the article. I support light rail – where the density and the demand warrants it. However, the Paine Field loop in (mostly) the city of Everett lacks the density and the demand. In 2003, all in-county bus service from south Snohomish County was axed. It has never been restored. In 2010, in-county service from north and east Snohomish County was scaled back to a skeleton level of service. Most of that hasn’t been restored. Reason: a lack of demand. In 2003, this limited stop express service cost a mere $1.00, subsidized further by their employer, but the fact is, most preferred to drive. Bus Rapid Transit will start service in the southern half of the loop in about 2.5 years’ at a cost under $70 million, most of that cost attributable to the segment 128th/I-5 east and south to Canyon Park, which ST-3’s light rail won’t cover. In other words, the duplicated segment from 128th & I-5 to Boeing-Everett will cost substantially less than that, for HOV lanes already exist there! To finish the loop, ST planners suggested extending the BRT line from Boeing-Everett to downtown Everett, which could be accomplished amazingly inexpensively and quickly. Buses going north would start at Seaway Transit Center (open in 2 years, just across the street from Boeing), hop onto the Boeing Freeway eastbound, wouldn’t even have to merge, for they’d be in an “exit only” lane so as to take the first exit at Evergreen Way, which the rightmost lane of the onramp takes them to. Turn left/north, and follow the existing BRT line, using the same stations, to Everett. Cost: I’ve been told about 4 buses, and I’ll round up to $1 million each, plus the cost for the drivers, and this could easily be accomplished for less than $5 million and operational by the time the buses come online, about 18-24 months. In other words, well before Northgate Link opens, and at least 15-18 years before light rail ever starts running (which could be open 5-7 years sooner by going directly to Everett). Further, BRT has a stop at Paine Field Airport, which is to begin commercial operations next year. ST-3 does not have a station there, apparently the primary objective importing workers to and from Boeing. In summary, I refute the blanket statement that BRT isn’t cheaper than light rail. It can be constructed faster and if the political will was imposed – vs. throwing up one’s hands and repeating that true BRT is impossible (while out of the other side of their mouth, making sure light rail isn’t), it’s appropriate for less-dense areas until and if they become dense, until and if the demand warrants it, and it’s less expensive in those less-dense areas. In the dense areas, such as between Ballard and the University district, light rail should have warranted more than a planning study, for this segment has been worthy of light rail for decades – and such a line would offer better north-south connectivity to/from jobs in burgeoning Ballard as well as for Ballardites who work in the north end! You have a point that Paine Field in Everett is waaaaay outside the area where density and demand call for rail. Rail is a *high capacity* solution, speeding hundreds of people at a time past congested roads. If you simply don’t have the volume to congest the roads, rail is pointless. In a low-capacity situation like this, you just want decent buses, and because volume is so low, *there’s no congestion* so the buses will run on time. Where did this come from? It is patently untrue. But SWIFT and RapidRide bus services in our area have little dedicated right-of-way, but both attracted about as much “new ridership” as Link light rail did. So, your comment is just nonsense. RapidRide currently has ridership close to Link light rail, but RapidRide cost only about $220 million for all the routes combined, compared to about $4.5 BILLION for the current Link light rail system. So, Link light rail cost about 20 times as much for about the same ridership as RapidRide bus routes. That’s a misleading comparison, SWIFT and RapidRide serve much larger areas, hence higher ridership. That quote is comparing different modes for a given route. If SWIFT or RapidRide gained fully dedicated right-of-way, ridership would certainly increase on those routes. I’m skeptical of the cost figures. “Guideway and Track Elements” are considered cost of the right of way, but is that true? I mean, with a bus system, there’s no overhead cabling, no tracks to lay down, etc. When we say that light rail to UW cost $455 million in guideway and track, are we saying that it would have cost $455 million in roadway were we to have built it for buses instead of for trains? I kind of doubt it. “Actual track work is part of Systems if you dig into the details of the actual construction contracts. Specifically contract U830 includes Track, Signal, Communications, Traction Power. And that is in the correct category. Separately, one of the most expensive components of Systems is Traction Power. And we would need that for trolleybuses too. So “Guideway and Track Elements” as a major category does not include the actual trackwork for U Link. It probably includes preparing the guideway for track installation, which is likely minor work and may exist in different form for buses too. It’s kind of a silly debate. If you want to build a new bridge to West Seattle, or a new bridge from the UW to Kirkland, then it really doesn’t make any difference. Yes, absolutely right Anton — a busway is just about as expensive as a railway. But guess what? There already is a bridge to both these places! Imagine that. So, now that we are living in the real world, with real roads and railways, how about we figure out the most cost effective way to leverage them. In this neck of the woods (where railways are rare and expensive) that means busways. It only makes sense to build very expensive railways, or very expensive busways, when they are worth it. If you doubt me, explain to me how much it would cost to build a busway from Ash Way to South Everett Park and Ride versus a railway. Oh, but before you answer, tell me which one would be more useful. Hint: A bus would be able to leverage the enormous set of roads nearby, while a train would be stand alone. In the real world, there is no existing transit way (for buses or rail). We’ve had congestion and buses since the 60s, when we decided not to build rail. The fact that we haven’t dedicated road space to buses since then tells you that it will practically never happen. The political cost of taking a lane away is much higher than the political cost of approving a new tax to build new right of way. That’s what BRT supporters try to ignore. That is a called a straw man argument, sir. Well played. Not once did I suggest that we convert a general purpose lane (is that your plan for the railway as well? If so, why is that politically easier?). You completely missed the point. I’ll answer the question for you — a brand new busway would be relatively cheap and likely much cheaper. Just look at it: Here is Ash Way: https://goo.gl/maps/RFAtmPwtkVp. Notice the ramps that go from the south and connect up to it. These are bus lanes (not HOV lanes) that use the median. You will notice that it would be fairly cheap to extend this roadway north. You simply continue to use the median until it gets too narrow or you encounter a bridge. Doing so is extremely cheap. As it turns out, there aren’t any major barriers between the two stations. The only bridges are on 128th and 112th. It looks to me like neither is a barrier. But even if they are, you just end right before 128th. You’ve built a busway (again 100% buses — no cars allowed) for 90% of that stretch. Now assume that was all that you built. Just a busway from Ash Way to 128th. This is likely way cheaper than a railway, but that isn’t the main point. The main point is that it is way more useful. A railway has to connect to a bigger railway to make sense. Same with a busway. But around here, you can build cheap additional busways that connect into the roadway far more often. Imagine you are riding a bus from Lynnwood to South Everett. The initial part of your drive is slow (about 30 MPH — oh the horror) because the HOV lane is full of two person carpools. Now you reach Ash Way and the driver changes lanes into the busway. You go to full speed all the way to South Everett. It didn’t cost much at all, but you got 90% of the benefit. This is much better bang for the buck, and you didn’t have to convince a single carpool driver to get another passenger. If you’re suggesting running “BRT” in our existing HOV and general-purpose freeway lanes, as it sounds like you are, that’s not a solution. Those lanes do not keep today’s buses moving reliably, and the changes required to make them reliable are not politically possible. Even if we remove every weave. No. No. No. Read it again. I don’t even use the word BRT. I am suggesting BUILDING a new BUSWAY. Several new miles of 100% bus only lanes. These are cheap because they would be built where it is cheap to build them. During part of the trip, the bus would run in HOV lanes, but during most of the trip, it would run in bus only lanes. Is that “BRT”? Who cares? Just about every rider who takes that trip won’t have a door to door “BRT” experience anyway. They have to get to the station, and only a handful of people can walk to it. Almost everyone has to take a bus. Consider the alternative. A multi-billion dollar busway or railway that goes from Lynnwood to South Everett. Of course this would be better, but the cost is huge for what you get. You save every rider a couple minutes (at best). The door to door experience is still not “BRT” (or light rail) for the vast majority of riders, and the slowest part of their trip (getting to the station) remains unimproved. For the cost of that one little section you can fund a huge amount of extra bus service that would make a much bigger difference in the door to door travel times for most of the riders. This is just an example, but it can be found all over the place. Busway improvements can be made piecemeal, whereas railway improvements can not (in this area). That is the biggest difference between the two. Building a new busway is uniformly a terrible idea. If you can build a busway, you can build a railway, and it’ll be better and cheaper to build and cheaper to operate. Period. Yeah, you can put rail on the route you suggested, too. Go ahead. In Cincinnati, Metro X commuters routes are allowed to drive in highway shoulder during traffic jams. ST and WSDOT are rolling out shoulder running; I believe it already exists in some areas, and ST3 will fund capital expenditures to allow for additional shoulder running. The only problem with the article is that Seattle’s LRT is in reality a light-metro that uses light rail vehicles. With well over 80% of the route on viaduct or in a subway tunnel, in no way can Seattle’s can be an example of LRT, in fact Seattle’s “rail” system has more in common with Vancouver’s light metro system than Portland’s LRT. 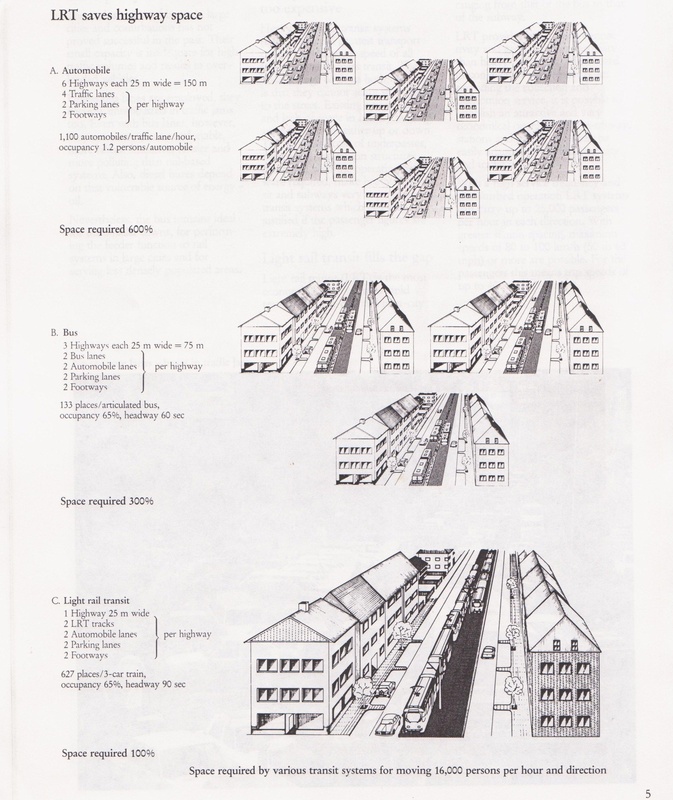 The following schematic from 1986 shows that buses need at least three times the road-space to move the same amount of people as light rail. Right – the additional expense is to create grade separated ROW. Your schematic isn’t grade separated. Links has that in segments, such as along Rainier Valley and parts of East Link. For much of ST2 & ST3, the decision has been made to build grade separated LRT to ensure greater speed & reliability. Because LRT is not grade separated, light-metro is. There is no such thing as grade separated LRT it is indeed light metro. You have been fooled. OK cool, so it sounds like light metro is an effective shorthand for “grade separated light rail.” I think my actual arguments are unchanged? Actually at-grade LRT made grade separated light metro obsolete and what is happening in Seattle is throw-back planning based on 1950’s transit planning. ICTS/ALRT/ART and VAL could not compete against at-grade LRT. The only reason Seattle is building with stealth LRT is because of the previous monorail debates, where slick willy salesmanship sold everyone a packet of lies. In the real world, your transit plans are 3 to 4 times more than they should be and your hybrid light metro system will be not very effective, in other-words a bad investment. Great article. Thank for breaking down the portion “right of way” and light rail components. I feel your argument is pretty strong. I assume BRT also need on / off ramp, which light rail doesn’t. I suppose lightrail station would cost quite a lot more than stops of BRT. (I could be wrong, as there tend to be more stops than station). Overall, my pure speculation is that they cancel out. However, how “Guideway and Track Elements” being part of “right of way”? If those where not needed by comparable BRT, then it will change the math to about 60% / 40%, instead of 87% / 13%. Actual track work is part of Systems if you dig into the details of the actual construction contracts. Specifically contract U830 includes Track, Signal, Communications, Traction Power. And that is in the correct category. So if anything the above proportion is very conservative and the actual should be closer to 10% light rail + 90% right of way. I think BRT does not always run with Traction Power though. I think C-Line doesn’t. Current RapidRide lines use diesel buses. Yes, they are hybrid, but while that improves their fuel efficiency it doesn’t change the fact they are producing CO2 emissions. If we want to get away from this we’d need to use trolleybuses which have a lot of support from the community (they are also extremely quiet). 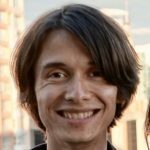 There is an interesting blog post by Jarrett Walker about streetcars: http://humantransit.org/2009/07/streetcars-an-inconvenient-truth.html. It it, he mentions the two main advantages of streetcars — existing rail right of way and capacity. The same can be said for rail in general. In terms of capacity, it really isn’t an issue with any of the new lines. None of the regions that will be served (even Ballard) have the density to create capacity problems. Buses given the sort of right of way you suggest (the type we are willing to give the trains) can handle the problem quite easily. With off board payment and level boarding, you have dwell times of less than 20 seconds. Buses can arrive and wait thirty seconds at a stop, and consistently serve every stop. This means that buses could handle about 14,000 an hour without the need for passing lanes. Of course, you could add passing lanes (something that the old bus tunnel had). At worse you do get bus bunching. This would mean travel time along a shared corridor (e. g. a bus tunnel) would be a bit slower than you expected. The buses would (of course) disperse as they left that area and spread outward. Compared to requiring a transfer, this is a very minor problem. In terms of leveraging the existing right of way, the advantage goes to the bus — by a wide margin. The best example is Ballard to West Seattle. West Seattle would need a new ramp to the SoDo busway, along with signal priority. The freeway already has bus-only lanes, and the weave (a congestion problem) could be eliminated by extending the ramp. The end result is exactly the same right of way (from West Seattle to downtown) at a much cheaper price. The WSTT (http://stb-wp.s3.amazonaws.com/wp-content/uploads/2015/02/WSTT-Initial-Service-Pattern.jpg) also contains another example of leveraging existing infrastructure. It serves the Aurora corridor, which has buses that have about half the ridership of Link. While it wouldn’t provide the 100% grade separation you imply is essential, it would eliminate the greatest bottleneck. Light rail, of course, is not slated for the Aurora corridor, because it too expensive! You can’t add all that and fit the budget. But building the WSTT (and the ramps to West Seattle) would surely fit into the budget and probably be quite a bit cheaper (building brand new bridges is expensive). Cheaper alternatives can also be found in the suburbs. Consider the bus-only ramps that serve Ash Way (https://goo.gl/maps/L4ry5cTomWz). They start about a half mile south of there. It wouldn’t be too expensive to extend those all the way to I-405 to the south, and all the way to the South Everett station to the north, using only the median. This means the right of way is already owned! Buses could use this inner busway not only to connect to the other stations, but to avoid traffic. In general this isn’t a major issue (most of the HOV traffic is found south of there) but having that option would largely eliminate congestion for the buses. It is true that busways are often just as expensive as railways. If you start from scratch and head out into the flatlands, they certainly are. But busways can leverage existing freeways, thus providing a substantial savings. In the case of Lynnwood/South Everett (my last example) you wouldn’t get 100% grade separation. But for a corridor like that, it doesn’t matter. It would still be substantially faster than driving (if there is congestion) and an express (that skipped all those stops) would be faster than the rail that is proposed. More to the point, there are likely other projects (within those very areas) worth spending the money on. Which gets me back to the WSTT. The model would be similar to Brisbane. The advantages, described really well in the “Update” section of this blog — http://humantransit.org/2009/11/brisbane-bus-rapid-transit-soars.html, make sense. Riders would get a direct ride from all over West Seattle, Ballard and the Aurora corridor to downtown and the places along the way. But assume for a second, that we need the capacity, and that building service for only that once corridor (West Seattle Junction to 15th and Market) is superior. It is really worth the money? Wouldn’t you want to spend some of it improving the Aurora corridor? 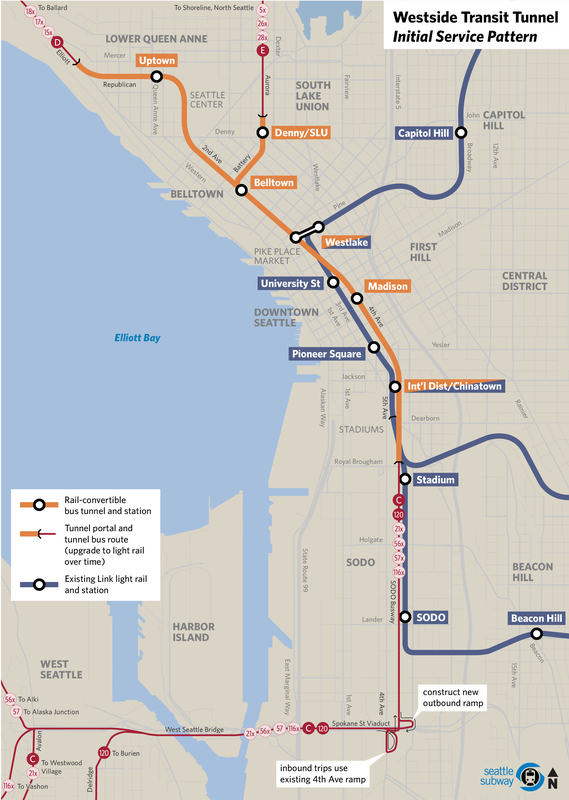 What about other projects, like the Ballard to UW subway, or the Metro 8 subway (which you said is a better value — https://www.theurbanist.org/2016/01/11/ballard-spur-and-metro-8-subway-serve-seattle-better-than-interbay-light-rail/)? In other words, assume you build the WSTT, but build it so that it can be converted to rail in the future (as was the other bus tunnel). Would anyone really say that the next project would be to convert it to rail? Converting that line (if it existed) would be very low priority. It makes sense to build the most cost effective set of projects first, which means to either build busways that can leverage existing busways (e. g. the WSTT) or subways that don’t have that option (e. g. Ballard to UW, Metro 8). I’ll concede that after Smith Cove, the advantages of rail over BRT is basically nil, but I think it’s a stretch to say the stations in SLU won’t have capacity issues with a bus tunnel. By the time anything is built, a Denny Triangle stations’s walkshed will be full of 40+ story towers in all directions. We’ve had this argument before – the most valuable part of a Metro 8 line is service to SLU & Uptown. The Ballard to Downtown line serves those neighborhoods well. I don’t understand why you would advocate for a bus tunnel between Uptown and downtown and then turn around and advocate for a rail tunnel between Uptown and Cap Hill. Because this isn’t the way you would build the Metro 8 subway. With all due respect to the article that was written by the Urbanist, that is a very poor routing. You don’t put stations on Denny, you put stations north of there. A Metro 8 also connects better to the rest of the system. It means a transfer north is faster, and a transfer to Capitol Hill and the Central Area is direct. Here is an example. Let’s say you are at Fairview and Republican, which is certainly part (If not close to the heart) of South Lake Union. Now imagine you want to head to 15th and Republican. This is exactly one mile due east. How do you get there, once ST3 passes? You walk 10 minutes and take the train one stop. Who knows how good that transfer will be, but Sound Transit has a terrible record as far as this sort of thing is concerned. Then you wait for the train, and take it one stop. Then you walk another ten minutes or so. You can take buses that help part of the way (certainly for the tail end) but in general, you are hosed. Link is useless to you, even though you are going to the exact neighborhoods (South Lake Union and Capitol Hill) supposedly served by Link. Oh, and this is one mile, as the crow flies! Another way to look at it is to just look at the stations. The problem with the station on Denny is that it is way too close to Westlake. This is fine if you you have a line (stops can be very close to each other) but simply not worth it for a transfer. So not only is the walkshed of that stop eaten up in part by Westlake, but even if you are trying to get to the other side of the station, it is not worth the transfer. You might as well get on that bus via Westlake (or just walk). The other two stations (one on Aurora and the other two at South Lake Union) are fine — but you are only adding two stations. Compare that to a Metro 8 subway, along with the bus improvements that are coming down the pike. I drew up a mockup a while ago: https://drive.google.com/open?id=13D-0dGpWZ_HPYbNXp0dWUtF1DAc&usp=sharing. This is just one possibility, of course. Maybe it doesn’t loop around towards Belltown, or maybe it takes a sharp turn to serve First Hill on the way to the Central Area. Regardless of all that, just look at where the stations are in South Lake Union. One is Fairview and Harrison, while the other is at Denny and Thomas (that one is the same as the ST3 routing). In that regard, it seems similar, but the difference between the other two stations is huge, even though they are only about a half dozen blocks apart. That half dozen blocks is the difference between whether it works or doesn’t. In short, it means that a much wider group of people can use it. Go out a quarter mile and you can see that it doesn’t overlap with any other station. If I thought that the Ballard line was a down payment on a future Metro 8 subway I might be OK with this. Split off after Aurora, serve the main part of South Lake Union (instead of skirting it) and then head off to Capitol Hill and the Central Area. Except I don’t see that. There are no plans for that, and I think it is crazy to think we will have that sort of system eventually. The simple fact that people are calling this “the most valuable part of a Metro 8 line” means that the Central Area is screwed, despite having population density far in excess of most of the state. 1) Yes, Metro 8 does a much better job serving certain trip pairs. I just don’t value those trip pairs as much, and those trips can be adequately served with local bus service. ST3 is building the line for regional connectivity; Metro 8 is a local solution for local trips. 2) If you remove the parts of the central district that are within the walkshed of ST2 Link stations & Madison BRT, it’s not any denser than a typical Seattle neighborhood. I don’t see why Cherry & 23rd is screaming for a light rail stop over, say, Georgetown or Madison Park. Anton makes a great point about trolleybuses in a comment above – if you want to electrify the WSTT, plus string trolley wire all the way between Ballard & West Seattle, you erase much of the cost savings of bus over rail. I don’t think the people of Seattle would be keen on a project that requires them to run diesel buses between Ballard and downtown a few extra decades. Take a look at the Roosevelt BRT project – currently 1/2 the proposed budget is being spent to electrify the route; that’s the value judgement the city is making. Not really. Running wire is really not that expensive (We didn’t need to pass a huge levy just to rewire Queen Anne). So if we wanted to, we would wire the heck out of these routes. The big savings come from not building new bridges. My guess is the difference between running the rail down 15th (the original proposal) and elevated (around a couple hundred million if memory serves) is more than enough to wire it from West Seattle to Ballard. Not that you need to do that. Buses run in the tunnel right now. I believe they are hybrid electric. In the past we had hybrid trolleys. This would mean connecting to the wires at say, 15th at the north end and the SoDo busway on the south end. Pretty easy to do, actually. The main benefit to running rail is capacity. I think it is unnecessary, and not a great value, but others disagree. Wire is expense, otherwise I’m pretty sure Seattle would have actually strung wire everywhere for purely environmental reasons. But yeah, electrification is a distraction from this debate. I do think Uptown & SLU merit the capacity of “light metro” (as ZweiSystem calls it), and you do not. Wire is cheap compared to a subway, but not dirt compared to what a city spends its money on. For the Roosevelt HCT project, they plan on spending 11 million for wire from 65th to downtown. It is about five miles, so less than 3 million a mile. It is dirt cheap compared to building a new busway or railway (essentially a rounding error), but still not so cheap to allow Seattle to string wire everywhere. Pronto is very controversial, but the wire for this one line costs more than it. In contrast, they plan on spending 7 million to move the streetcar stop a couple blocks. Pronto is not controversial because of what it costs, but for purely political reasons. Pronto costs as much as 1 or 2 trolley buses (without any money for their operation) so it’s basically free given its coverage area and we shouldn’t be debating it. But there are many people opposed to any spending on bicycle infrastructure trying to make it “controversial”. While you might be able to handle West Seattle with the existing bridge because you really don’t need a westbound lane as d.p. always pointed out, there is absolutely no way to make the Ballard Bridge into something that “real BRT” can use. Quit lying about that. Well, building a new Ballard bridge would be cheaper than building a new West Seattle bridge (and much cheaper than building both). So if your goal is to make something as good as Ballard to West Seattle rail, it could be done much cheaper, even if you did build a new Ballard bridge. But jump ahead lanes might suffice. As to whether this would then operate as “real BRT” from Dravus to Ballard, I have my doubts as well. But at that point is a new Ballard bridge (as nice as it would be) really your top priority? You’ve already eliminated the worst part of that trip (Queen Anne and downtown) along with the significant delay around Dravus and the approaches to both bridges. Maybe you build a new bridge (which would thrill the bike community) or you put your money into other projects. If a new bridge cost 100 million (or even 200 million) than it is cheap compared to the cost of building a subway line. But it is a huge amount of money compared to the RapidRide+ projects (http://seattletransitblog.com/2015/12/21/rapidride-the-corridors/). Tearing out the old Ballard Bridge and putting in a new movable bridge with BRT lanes, probably still 4 GP lanes, bike lanes and sidewalks would be a massive project. It’d be cheaper than building a subway line but not by as much as you think. If we implemented Ross’s grand plan, we’d probably still need a new Ballard bridge w/ bus lanes each way. The big savings of running BRT rather than LRT between Ballard & Uptown is along 15th Ave, which is plenty wide enough as-is. ST3 will build a rail viaduct parallel to 15th Ave, which will be expensive. North of Smith Cove, I agree with Ross – it’s much more cost effective to just upgrade the D-line to true BRT, even including the cost of a new Ballard bridge. Turn Smith Cove into a bus-rail transfer facility for routes coming from Ballard & Magnolia. Ross & I differ south of Smith Cove – I think the new light rail ROW between Smith Cove and SoDo is clearly better value than a 2nd bus tunnel. AJ, OK, then, by using BRT within Seattle you’ve saved the new bridge over the Duwamish waterway, a mile of elevated structure on either side of it and a mile and a half of elevated structure along Elliott West (although it is entirely possible to build at-grade north of the Magnolia Bridge by running the tracks between the playfield and the BNSF yard, putting the station nearer to Thorndyke where development is more likely). In trade for that, you have a new downtown rail tunnel which can accommodate Ross’s fish-hook shaped “Metro 8” subway, and trains to and from Renton and Kent East Hill. Yes, to do the former the Denny Station has to be prospectively “stacked”, adding a hundred million or so to its cost and for the latter MLK would have to be “treated” either with cross-road underpasses or its own subway tunnel. And, you gain enough capacity on the “Red Line” to extend it to Burien, removing many of the multi-seat ride objections. If the “peanut butter plan” — BRT only to West Seattle and Ballard — you are stuck with buses forever, because by the time that it became “necessary” to convert to trains there would be insufficient alternative capacity for the ejected buses before the trains began. Also, you’d have the same damn side-platform station designs rather than center-platforms. I think we are getting stuck in the weeds here. My point is simple: Busways can be built piecemeal and yet still provide a great transit improvement. The WSTT is a fine example. If you look at the map, you will notice a bunch of different buses that would use that — not only from West Seattle and Ballard, but from the Aurora Corridor as well. Now consider how you could improve those buses. Let’s take it step by step. 3. Ramps from Spokane Street Viaduct to SoDo busway. 4. Surface improvements on all these routes. 5. New West Seattle bridge. Compare this with the West Seattle to Ballard proposal. At what point are the busway projects more expensive?The first three items are the same for bus or rail. The fourth item is really cheap whereas building a new West Seattle bridge (for rail or bus) is extremely expensive. Thus you have to get to item number 5 (a new West Seattle bridge) before you have spent the same amount (or more) money on bus improvements. At what point do the bus improvements provide more time savings than the subway? I would say at the first project, but certainly the second. The WSTT provides a tremendous amount of time savings for buses from Ballard and West Seattle, but also for those that travel along Aurora. But even if the break even point occurs when a new Ballard bridge is built, then it is certainly more useful. You’ve then built practically the entire line, but also eliminated the transfer penalty as well as provided service to Aurora buses (which includes our most popular bus). Thus building busways *for this section* is a much better value. Busways can provide for piecemeal improvements, whereas subways can’t. It makes sense, then, to build subways in the select few areas where a busway wouldn’t provide much benefit (i. e. a completely closed system) or where capacity concerns are great (which is pretty much not an issue now that ST2 passed). You are wrong. Busways cannot be built piecemeal and if they are, they will provide very bad transit improvements. We have lovely examples from Ottawa (now converting their busways to rail), Pittsburgh, Brisbane (Jarrett Walker loves this one, but it’s a pile of crap because it’s always stuck at one particular traffic light where it merges into mixed traffic), and yes, Seattle. As for the bridgets — so far I have seen no proof that rail cannot go over the existing West Seattle Bridge. Everyone just handwavingly claims that it can’t. For high capacity service, buses are uniformly more expensive to operate. Nobody ever manages to achieve your magical, fantasic 14,000/hour number with buses — you’re just making it up. In terms of right-of-way, the key difference ist hat you can GET exclusive right-of-way for the train, and yuou can’t for the bus. See the discussion above about Portland MAX, and contrast the Orange Lie in Los Angeles, which is delayed at every intersection. *Even when you’re converting existing road lanes to bus lanes*, which is my favorite scenario for buses and the only one where I advocate buses, it’s typically easier to get exclusive right-of-way for rail. So you might as well do it. Couple notes on your cost breakdowns. 1) The ULink cost is missing about $500M. 2) U260, the track-specific contract for ULink, was about $7M. 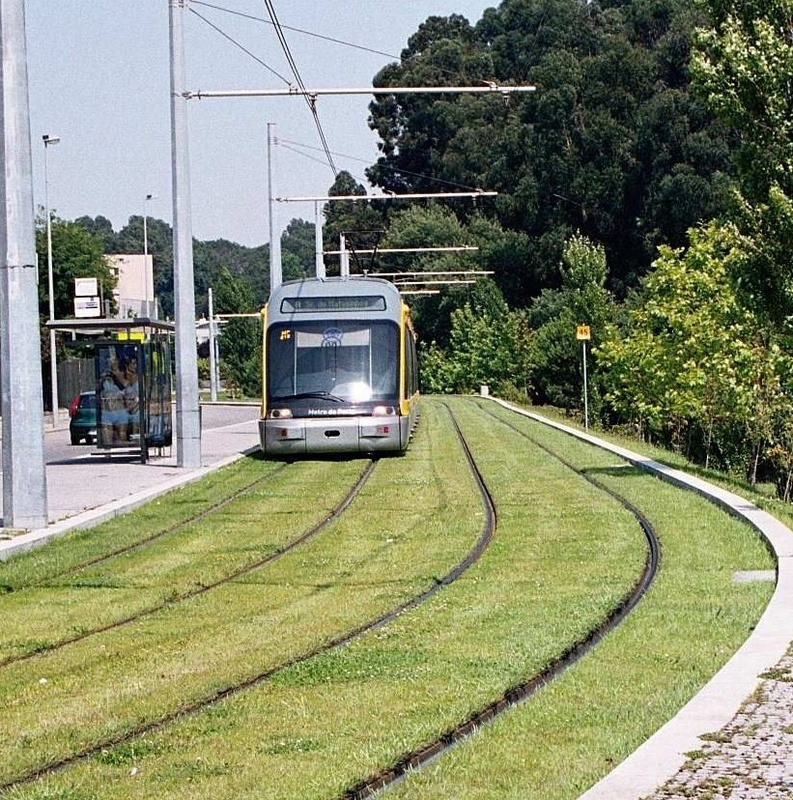 3) Systems are needed for any dedicated ROW and are not entirely LRT-specific. They include communications, fire/life safety (VERY expensive in tunnels), lighting, and signalling. Traction power and OCS are the only light rail specific components but would be required if our BRT were to be trolley bus. I’d argue that the total cost of ULink being light rail vs BRT is more around 1-5%. 1) The financing cost was not included, because it is proportionally distributed. I previously used the baseline budget, but have now updated the article to use the actually incurred budget. Indeed, this strengthens the point being made. 2) That is a great point, but I can’t find any record of U260 in the progress reports (although a few of the reports don’t load). Do you know in which report it was mentioned? 3) So if you look at U830 it says it includes Track, Signal, Traction Power and Communications. 3.a) For a bus ROW signaling can be much simpler as it’s essentially a highway lane (e.g.on 520 multiple buses can pull into a station, no signal needed). 3.b) Track is obviously not needed for buses, although special pavement work may still be needed. 3.c) I did mention in the article that using trolley buses would eat away at most of the advantage buses have over light rail. 3.d) Communications are the one piece that likely will remain in place. So, you are right that light rail will have an even bigger advantage, but my guess is it will get at best to being 10% of the cost. Transit opponents who try to tell us they support BRT = the exact same thing as –> Trump partisans telling us their candidate is a “tremendous supporter” of women. …building (politically untouchable) right of way…Fixed it for you. True BRT can be similar, but every pol in the ST subarea knows that in practice, BRT gets softened up to frequently arriving red buses. Also in practice, most suburban pols know this to be the case, so they want the politically untouchable right of way to affect as few voters as possible. Hence the park & ride. Have you ever ridden true BRT? I have in Mexico city. It’s dog slow compared to the subway there. Even with physically separated bus lanes, the buses still have to wait at busy intersections. I think the idea that BRT can be as fast or high capacity as grade separated rail is just a myth. Seattle probably had better BRT in the form of the bus tunnel than any of these systems people talk about. There is an excellent example of “what might have been” just 170 miles to the south. I don’t know how many of the readers are familiar with “West Side MAX”, but the 25-cent description is “a trolley on an old railroad right of way”. There’s more to it than that, because it can go 58 miles per hour, and it runs alongside US 26 and Oregon 217 for about three miles heading into Beaverton from Downtown Portland and has a long tunnel through the West Hills. But the part to think about starts at Beaverton Central and heads west to Downtown Hillsboro; every inch is in the old Oregon Electric railroad right of way. Now this is all “reserved” or “separate” right of way; no buses or any other rubber tired vehicles use it. But it’s also “at-grade” meaning that in most places roadways cross it at the same level. There are only two overpasses in the entire west end. Since the right of way was historically a railroad and MAX is, after all is said and done, a little train, at the road crossings the tracks (and the cars crossing them) are protected by “gates” of the sort you’ve seen everywhere in the country: the long red and white arm that comes down when a train approaches with lots of flashing lights everywhere. There are also the flashing “Train” lights like those Link has above each lane. If Westside MAX were Westside BRT those gates would be gone, replaced by stop lights very importantly UNDER THE CONTROL of the local highway departments. Ooooohhhh! Can you say “delays”? Can you say, “Make the bus wait for ME”? Well, lots of voters can. And would. I think you are absolutely correct in stating the difference between LRT and BRT is not rail vs bus, but dedicated ROW vs mixed traffic. In the Puget Sound, light rail is a much more effective mechanism for creating dedicated ROW vs BRT, primarily for political/structural reasons rather than engineering/technical. Nonetheless, it is certainly possible to create dedicated bus ROW, depending on the project. Madison BRT and 522 BRT are creating significant bus-only ROW. The new 520 bridge creates an new HOV/Bus crossing of Lake Washington, and the expansion of the 405-167 corridor is adding HOT* lanes, not GP lanes. As an example of a future project, it may be significantly cheaper to rebuild Aurora Ave so that the E-Line has center running stations rather than upgrade the E-Line to an LRT line. Finally, this analysis is incomplete without looking at the cost of building new bus only ROW. While I prefer the proposed ST3 2nd tunnel for many reasons, one of the arguments for a new bus tunnel – rather than a 2nd rail tunnel – is cost. I like the analysis identifying 80% of project costs as ROW construction, but you appear to simply assume BRT grade-separated ROW is the same costs as LRT grade-separated ROW. *I believe this blog is deeply skeptical of HOT lanes as effective transit infrastructure, but I am optimistic. At minimum, HOT lanes are an effective political compromise between transit-only lanes and simply adding more GP lanes whenever there is a highway expansion. I’m sorry this is the worst article on BRTs I’ve ever read. The reason they are cheaper is you DONT HAVE TO BUY RIGHT IF WAY you have to repurpose assets. Building right of way for BRTs is stupid – but that’s because you don’t need it (unless you are still stuck in he 1980s). Sometimes you need it, sometimes you don’t. Sometimes it is cheap to build, sometimes it as expensive as a railway. With both a railway or BRT you can leverage what is already there. With BRT, there is a lot more already there, which means that it is usually much, much cheaper. Often all you have to do is focus on the bottlenecks (such as downtown) and everything else is just fine. That is how Madison BRT, for example, will work. Which begs the question — how would you replace Madison BRT with rail? To begin with, you would have to tunnel, since trains can’t go up the steep grade. So that means spending billions more not only on the tunnel, but on the stations. Oh, and the stations would be deep underground, meaning you add several minutes to the time it takes to get anywhere. The end result would probably be *worse* for transit users, while costing billions and billions more. Of course if you built the exact same type of thing and put buses in it, then it would also be really expensive, but that is not the point. The point is you don’t have to! That really is the key difference. There is more flexibility (in most cities, but certainly in ours) with BRT. You get to leverage the existing roadways (and there are a lot of them). The cost of the light rail is the cost of full segregated ROW — and that i PRICEY, but after lessons from Dallas, Portland and elsewhere very ,very welcome. For sure – grade separated ROW is a step above at grade ROW in terms of both speed & reliability, and there is a corresponding increase in cost. It all depends on the particulars of the corridor. Madison BRT is great given the very high cost of grade separation downtown, but wouldn’t scale well for intercity transit. Some routes should do great as full BRT (E-line, Delridge, etc. ), others do not. Rapid Ride F is a great example where no amount of bus lanes & signal priority would get anywhere close to the value of creating grade separated ROW. Surface running rail from Ballard to Downtown would be a terrible investment given the lack of grade-separation. And so forth. I would say the surface running in RV is adequate for regional needs – 6 minute headways should be sufficient for that corridor once Link is running 4 cars. We are many decades away from upgrading that section of LINK to grade separated because the incremental value doesn’t merit the cost. This is not true. As discovered in Europe and now called the Light Rail Renaissance (which is combination of low-floor cars, operating on a reserved rights-of-way, with priority signalling at intersections) ha found that trams (streetcars if you like) operating on a dedicated at-grade R-o-W, or a reserved R-o-W has almost the same operating characteristics of a metro, only on a smaller scale. The speed issue comes from the fact that grade separated stations cost a lot more to build than at-grate stops, thus rail transit operating on a grade separated guide-way tends to have one half to one third the number of stops. This does give faster journey times but it comes at a costs because it does not attract the ridership that an at-grade system does. User friendliness is the number one trait of a successful transit system. In the USA, politicians force the construction of very expensive grade separated transit systems as a way to get cash flow to political friends and insiders as happens in Vancouver BC. From the many comments here, knowledge about modern LRT is about 30 years ou of date. Photo: Modern lawned reserved R-o-W and simple station on a classic European tram. Right – and we are building exactly that, with the Central City connector street car in downtown Seattle, which is great, and the Tacoma streetcar, which is OK. Further, large sections of the light rail lines do in fact run at grade, mostly with freeway alignments but also segments like in downtown Redmond & South Kirkland where they follow old rail RoWs. However, ST3 is generally building lines at a regional level, where “light metro,” as you call it, is more appropriate. Actually at-grade has superior operating characteristics than grade separated. Only in the USA that LRT masquerades as light-metro, strictly for political reasons. 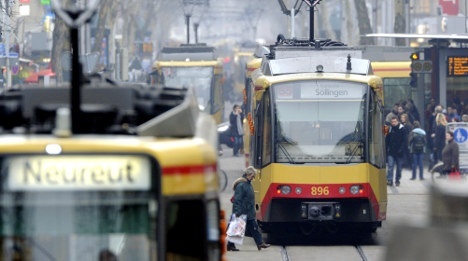 The European light rail Renaissance came about when building light-metro or the German S-Bahn (Stadt Bahn or city railway and not to be confused with Strasse Bahn or street railway) was deemed too expensive and now with articulated trams in wide circulation, one could carry as many customers on-street as grade separated. It was far cheaper to build at-grade than grade separated and the money saved was spent extending the tram lines and creating the all important network. The low-floor car was just icing on the cake. this is the lesson not learned in North America, where transit planners are fraught with Lysenkoism, trying to force square pegs into round holes. The result, hugely expensive light-metro lines (with a few km of at-grade to further the bureaucratic illusion that it is LRT)that do little to alleviate congestion and gridlock. As I said before, grade separation only gives the allusion of being faster than LRT because there are much fewer stations and fewer stations means fewer customers. Seattle is spending 2 to 5 times more to carry the same amount of people. You are severely mischaracterizing the overall trend of light rail construction in North America. Regardless of current trends, Germany has built far more underground Stadtbahn lines than NA has or is planning to build, including all major cities, and is still building or has recently completed more lines still — this has virtually futureproofed future on-street extensions to the network you tout so much, and in such a way major US cities cannot replicate without doing the same. The four cities that are building or planning underground light rail today (LA, Seattle, Dallas, Ottawa) are not only outnumbered by the numerous light rail in smaller cities without grade separation, but already have an existing strong base of coverage and/or ridership that demands faster, more efficient service through the center, especially as more lines are linked to the central network. In all other cities the system was long relegated to being a surface-only operation after a tunnel was thrown out of consideration because the metro area was too small to support its costs, which is not the case in larger cities (800K/1.2M) as mentioned. Fewer stations with grade separation does not dogmatically mean fewer customers. The far faster maximum capable speed between stations (60-80 kmh) offsets the additional time required to walk to the station, and the last mile problem is mitigated anyway by prioritizing TOD near transit stations. The obvious benefit to grade separation is the elimination of bunching from multiple converging lines and achieving a more consistent reliable headway. Agree. Zach does a good job here breaking down why Link is a better product than the at grade rail in cities like Portland, Minneapolis or Dallas. You cannot compare Link with MAX as one is LRT and the other light-metro. The cost per revenue passenger for LINK will be massive. The trouble in the United States is that your transit planning and transit philosophy came to a screeching halt in the 1980’s and you are locked in the 1980’s. Canada too suffers from this malaise. In Europe they have progressed to a point where modern LRT can affordably be built in cities with populations around 200,000, yet the mode can compete with metro in cities with populations in the millions. Throwing money at transit has never solved a thing. ZweiSystem, I once watched a documentary about the Ruhr German region with a “bankrupt” or rather financially in trouble light rail system. It’s not the fact that they had tunnels that was bankrupting them, but the fact that jobs and people had left the region. Basically the same story as Detroit, but in a much more orderly German way. But don’t blame light metro for that. Wrong. In the late 80’s and early 90’s there were about 100 km of abandoned subway tunnels (some in use today) because the operating authorities ran out of money. In fact Germany was planning to close almost all of its surface tramways by the year 2000. Didn’t happen as financial and operational realities set in. 1) Subways were expensive to build and operate and came with a secondary problem, maintenance costs. These new costs just could not be borne by the taxpayer. 2) Overall ridership decreased. Example: If a subway replaced three tram lines (which say carried 120,000 a day), the subway only carried a percentage of the three tram lines (some cities it was as bad as 50%) the rest of those previous tram customers took the car, as they perceived the subway to be inefficient. Subways are only built in Germany today if the operating authorities can prove to senior governments, that there is a direct need for a subway, such as Karlsruhe Germany, which because of their vast success of TramTrain, the main tram route through the city was seeing ridership in excess of 35,000 pphpd. With coupled sets of trams and TramTrains passing every 30 seconds. The main problem in North America is the term “rapid transit” and not use transit mode. Vancouver and Seattle are being used abroad of examples on “not how to build transit” and both cities adherence to light-metro, a niche transit mode, only continues this. Build real LRT and your BRT competition will disappear. Photo: The “gelbe wande” (yellow wall referring to Karlsruhe’s trams colour scheme) on Kaisserstrasse in Karlsruhe Germany. Zwei, I think you just mentioned why “light rail” (as you describe it surface rail) makes sense for some areas and not others. If you have miles of existing railway — much of it abandoned — then it makes financial sense to use it. If not, then surface rail only makes sense when the capacity is needed and building it is feasible (i. e. the route is flat enough to support rail). It is rare in Seattle that this is the case. There are only a handful of areas where the extra capacity and expense of rail is justified, and most of them are not along a flat corridor. You can’t run surface light rail up Madison. If the Roosevelt HCT project was light rail (streetcar, but with four car trains) it would be silly. Rarely would the train fill up, yet the extra cost of building the huge stations would add considerably to the cost. That is why light metro makes sense for Seattle as well as Vancouver. The key (in both cases) is to build it where it makes sense and run complementary bus service. Vancouver has succeeded quite well in that regard, while we’ve struggled. Again dated thinking. I do agree Seattle has some issues that a subway my have been a solution for, but my conversations with transit authorities over a decade ago pointed to the fact, Seattle’s subway/light-metro planning as a direct result of the monorail debates. Transit authorities neede to counteract the nonsesne from the mono lobby with light metro, but call it LRT. As stated before, the USA was seen in a leadership role with modern LRT in the 80’s and 90’s, not so today, where transit planning has just become a vehicle to squander billions of dollars more than one should have. As I have stated before, build real LRT at one half or one third the cost and BRT advocated will be left at the starting post. German cities bankrupted most of the transit systems that went underground and today subways are built only as a last resort, when traffic flows along a transit route see very close headway’s.. Example Karlsruhe Germany where traffic flows on Kaisserstrasse trambahn were exceeding 30,000 pphpd in the peak hours! Read a little bit of transit history and you will be amazed at what at-grade LRT will do. TramTrain (trams or streetcars that can operate both on tram lines and regular railways have attracted fr more new customers to transit in Germany than subways. Speed of a transit system is not the best attraction for people using transit, it is user friendliness and subways are, by construction, not. What Seattle is building is 1950’s transit planning at its worst. Is the Karlsruhe “Kombilösung” tunnel not being pursued precisely to extract more capacity out of the Stadtbahn central trunk? Why would they be still building this if it is “bankrupting” the city? You have a strange ideological fixation against tunnel building. If costs aren’t an issue (as they frequently are in America), tunnels are a necessary and vital step to improve transit. Capacity is a function of headway and a tunnel will not increase headways as 30 second headway’s (as seen on the route) is the maximum practical headway one can achieve. The tunnel is being built to reduce congestion because at peak hours, the yellow or gelb wall of trams creates massive congestion. Your assertion that ” tunnels are a necessary and vital step to improve transit” is both dated and silly. You have no grasp at all on modern public transit philosophy. You are talking light-metro versus LRT and LRT made light-metro obsolete about 30 years ago! Road crossings are a myth and no different to a light controlled intersection. What is needed is CCTV at road crossings and fine all motorists who fail to obey the law. Problems with road crossings will end very quickly. That’s a political solution, not a technical solution. Actually it is practical solution. We must rise from 1950’s style planning as the logical solution is to ban all light controlled intersections as they cause accidents. By the way, in California, a road/rail intersection is 10 times safer than a road/road intersection. Oh, it can certainly be an effective solution, and it is very practical. What it is not, unfortunately, is a feasible solution, given the current political environment at the state & local level. Running rail at grade with frequent at grade intersections is threaten by “BRT creep.” One of the biggest arguments for ST’s proposed projects is they defend against BRT creep. In a different region, this argument may not be valid, but I believe it is critical here in the Puget Sound. Bad logic; at-grade LRT is far more cost effective than BRT it is your light-metro system that invites BRT creep. I always find it interesting that those who support light-metro fail to see the economics of it, the high costs of construction, operation and maintenance soon make light-metro impractical. So much money to do so little will become the epitaph of Seattle’s transit planning. ZweiSystem, we are not making this up. Seattle has had at-grade light rail proposals before and as far as I recall certain segments were listed as in “mixed traffic”. Basically a streetcar. Why? Because there is opposition to everything and unfortunately part of that opposition will fight to make projects cheaper and ultimately slower. With light metro that opposition can’t win – it’s an all or nothing deal. That obviously has its own downsides, but as a region we’ve chosen to fight for high-performance high-ridership-attracting transit or delay its implementation. We don’t want to get low-grade substitutions like enhanced bus service and then have somebody say “look, you got your (poor) transit, no more funding for you, too bad your ridership is weak”. No matter how designed, HOV lanes are basically worthless on a downpour day, when semis wreck across them. It’s been proven in many places (including Ottawa and Pittsburgh) that if you’re creating dedicated bus ROW, it’s almost always cheaper to create dedicated rail ROW. The exception is if you’re converting existing general purpose lanes to bus lanes, which seems to be politically nearly impossible.